The Internet of Everything (IoE) is a concept that aims to look at the bigger picture in which the Internet of Things fits. 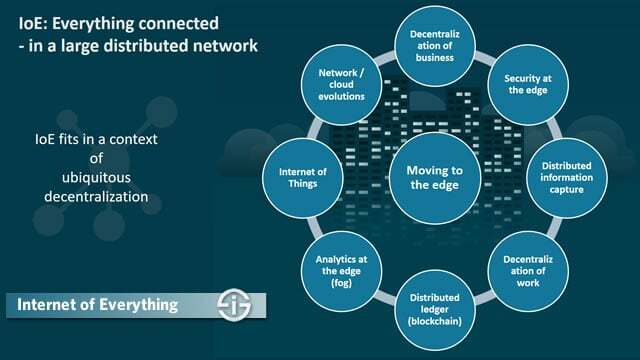 Yet, when you look deeper at IoE, you’ll notice it really is also about the vision of a distributed network with a growing focus on the edge in times of ongoing decentralization, some digital transformation enablers and a focus on IoT business outcomes. The Internet of Everything is coined by Cisco but also used by some other firms now and then, even if de facto in the perception of people it is mainly seen as related with Cisco and most resources come from Cisco so you’ll hear the name Cisco quite a bit in this overview (we are not affiliated in any way). Knowing that Cisco is not just a big player in the Internet of Things landscape but also, among others takes a leading role in networks, security, technologies for human interaction (in business) and the optimization of business and industrial processes, there is also a branding aspect to the Internet of Everything. Nevertheless, it is certainly worth to take a deeper look into it as it’s important to have a broader and more holistic view of the overarching evolutions in which the Internet of Things fit. Moreover, even if Cisco tends to depict the Internet of Everything as a next stage in the Internet of Things, it is as much related with the Internet of Things as it is with the third platform and the hyper-connected distributed reality which is seen as the foundational technology and processes stack enabling digital transformation, with a big role for distributed networks and computing, areas which are important for Cisco. Note that, also given the background of Cisco, with the Internet of Everything, we are more in a context of business and industry (Industrial Internet of Things), rather than the Consumer Internet of Things. Also note that Cisco is not the only one that aims to take a broader view and push the message that the Internet of Things, no matter how important and vast it already is as such, is part of a bigger picture and cannot be seen without understanding that bigger picture. As an example: look how in the Industrial Internet of Things, more extensive terms such as Industry 4.0 and the Industrial Internet are used. Finally, also note that the Internet of Everything partially was conceived to transcend the rather passive IoT view and the machine-to-machine (M2M) dimension. However, M2M is just one part of the Internet of Things and we are also moving further away from the huge but rather passive approach (data from sensors) to a far more active one whereby actions in the physical world are what matters (data from sensors to physical action as a consequence). One of the furthest reaching manifestations of this is the so-called Internet of Robotic Things. This is the context in which the origins and scope of the Internet of Everything need to be seen. Originally Cisco defined the Internet of Everything as the intelligent connection of people, process, data and things. Now Cisco’s Internet of Everything newsroom page says: “The Internet of Everything (IoE) brings together people, process, data, and things to make networked connections more relevant and valuable than ever before-turning information into actions that create new capabilities, richer experiences, and unprecedented economic opportunity for businesses, individuals, and countries”. According to the company, with the Internet of Everything there is $14,4 trillion in “Value at Stake”. Again, this is not the Internet of Things as we sometimes read but the Internet of Everything which is not the same as you’ll read. The number also deserves an update as it was originally released in 2013, yet continues to be used. We’ve embedded the so-called Internet of Everything or IoE Value Index from 2013 below. For Cisco the Internet of Everything is the next wave of Internet growth which, as an overarching term points at the connection of things, people, processes and data in one vast distributed network. This distributed component also about the evolutions in computing and networking overall whereby there is a clear distributed shift, towards the edge. These distributed models are seen everywhere in IT, in Internet of Things technologies (which already of course has a strong distributed component at the edge) and even in the ways we organize our businesses. In fact, the Internet of Things is already a decentralized given as such. In the latest cloud and computer network technologies there is a shift away from a centralized view towards the network elements and edges as well. In an age where software eats the world, network intelligence and virtualization, along with the injection of software defined networking turn networks and all their components in a decentralized, yet centrally manageable, reality. And with edge computing the focus is on analysis IN the network. In document and data capture there is a shift from traditional centralized approaches towards distributed or decentralized capture models and to hybrid approaches whereby the traditional way of centrally digitizing documents in one place is making way for these decentralized models, wherever they make sense. In the Internet of Things and in several other applications, for instance in the finance industry and even in security, we see a growing attention for blockchain or distributed ledger technology. As the name indicates we are again talking about decentralization. More about blockchain and IoT. As said, all the mentioned evolutions fit in a broader technology and business reality of decentralization. The decentralized way of working, for instance, whereby we work less in a central office and more on the go. Organizations are also increasingly outsourcing activities, IT and business processes to partners so they can focus on their core activities, which means again a form of decentralization. It’s clear that such evolutions impact the technological realities which have to enable them. Because, make no mistake: ‘distributed’ or ‘decentralized’ does not mean that IT, security officers and so forth don’t want a central visibility and control possibility. And this is precisely where we see many evolutions: platforms to manage a de facto decentralized reality centrally. Hopefully these examples make the larger picture of the Internet of Everything a bit more tangible. It won’t come as a surprise that Cisco is active in all of the before mentioned areas, except document capture. Back to the Internet of Everything concept where everything and everyone, including processes and data, are interlinked in this big distributed network reality and where Cisco clearly plays a big role in the many network evolutions. Other challenges for the Internet of Everything (and the digital economy in general) obviously include cybersecurity and data. As Plamen Nedeltchev; Ph.D., Distinguished IT Engineer at Cisco wrote in a piece, entitled the Internet of Everything is the new economy: In the IoE, identity must extend beyond the conventional. If identity is compromised, the security perimeter is defeated. Simultaneously, creating a unified identity that addresses users in the physical and virtual world will continue to be a challenge. It’s something we like to keep stressing. If you really look close at the Internet of Everything you see that, as we said, it is as much related to the Internet of Things as it is to the technologies and realities which we typically see as foundational for digital transformation. After all, what else is a distributed network with data, people, process and devices than a technological and conceptual view of today’s hyper-connected digital business reality with a twist of distributed technologies? However, that doesn’t make it much useful to closely look at. We don’t know if the Internet of Everything will continue to exist as a term and concept. What we do see is that since a few years Cisco seems to increasingly use the Internet of Everything and Internet of Things interchangeably, which can lead to confusion. Moreover, the narrative of the Internet of Everything sometimes stays close to the concept as described and illustrated but at other times is very much about the Internet of Things. Maybe one of the best ways to see the differences between IoT and IoE are to look at some of the Internet of Things examples we’ve listed. Especially look at those from Cisco. The Industrial Internet of Things case in the mining industry we described, for instance, really is an Internet of Everything case. We emphasized the IoT aspects but the project involved far more than that. One of the essential challenges to tackle, for example, was the realization of an IP network in the mentioned underground mine. While connectivity is key in IoT, the network enabled much more: the use of video, communication between/with miners, including the usage of collaboration and IM tools (which revolves a lot around the people aspect) and more. Take a good look at the sources we used for the case and you’ll see the Internet of Everything as Cisco sees it in action and how it does go beyond IoT alone. Read the case. Top image: Shutterstock – Copyright: Zapp2Photo – Images used for infographic – copyright: prizma All other images are the property of their respective mentioned owners.